Geoffrey Gorman (contemporary) I love his use of found material. The way he combines unexpected material, that other people would cast off, to capture the essence of his animal figures is masterful to me. I would love to hear conversation about his color combinations, textures, subject matter and where he gets his good junk. All my life. my very first mixed-media project, at age six, was taking an old wasp nest and adding colored plastic crystals in each section with Elmer’s glue. Getting started. I may have an idea that I like, sketched on paper, but I can be intimidated by the process of taking it into 3-dimension. Though, once I get started I love the part of the process where my inner muse takes over and the magic happens. 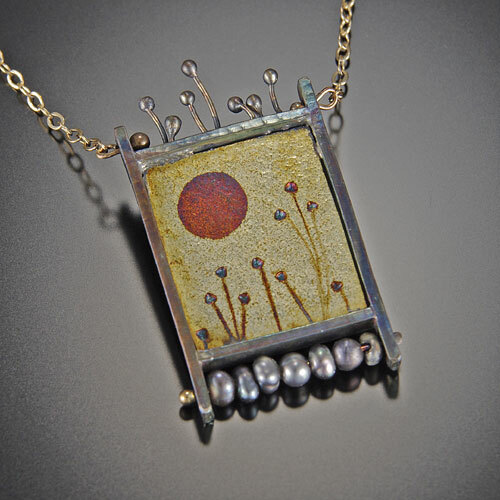 To learn more about Melanie and see additional images of her work, click here. I have been making Art all my life! I have been making Jewelry for about 12 years and actively marketing it for the last 8 years. My processes vary quite a lot so the time involved also varies widely. The Kumboo pieces that I specialize in take about 30-60 minutes. The most difficult thing is coming up with new designs. Once a design begins to sell well, it is an easy thing to continue to make it rather than search for new ideas. I try not to settle into this routine. This will be my first time at Magic City and I am looking forward to it! One of my favorite show to do is the Decatur Arts Festival in Decatur, Georgia and the other would be Atalaya in Huntington Beach State Park in South Carolina in a fantastic setting. To learn more about Jim and see additional images of his work, click here.